I’ve said this before, many times, but it bears repeating – the best thing about cooking is the transformation of unpromising ingredients into something better. Take this dish… normally, I’d never dream of eating a piece of brisket without at least a couple of hours on a low heat, let alone raw, but here it is – a raw piece of brisket that tastes much more expensive than it should. It’s brisket masquerading as fillet steak. So, how do you add so much value to a piece of the cow’s cheapest meat? Start with a piece of beef. The fact that the meat will be given a short cure means that you don’t have to go for a tender cut – the salt will tenderise even the toughest cuts if it’s given enough time. Any cut that’s very lean will do, but I plumped for a flat piece of brisket this time. The butcher cut me a 400g piece and tried to avoid as much of the fat as possible, such is the value of using a proper butcher and getting to know him or her. Incidentally, my butcher is great – she knows I cook some slightly out of the ordinary things, and takes a genuine interest in them. That’s a very good quality in a butcher, or any local business person, for that matter. There should be more butchers like Binns of Saltaire. Now for the magical part…you’ve got some beef, now you need to get some flavour into it. 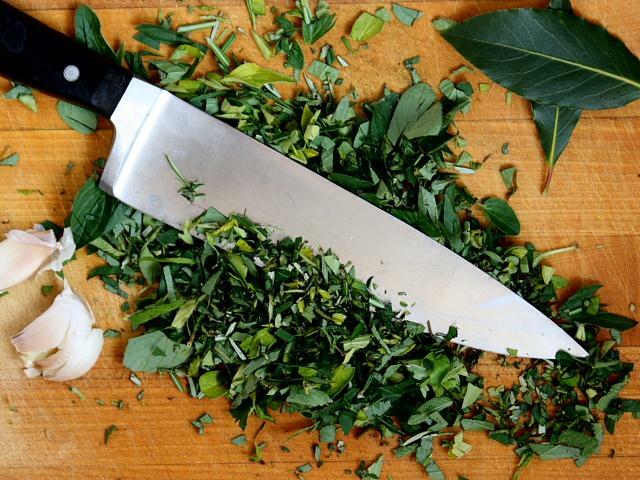 Chop together a couple of handfuls of mixed, fresh herbs such as thyme, marjoram, parsley, rosemary or oregano. The exact quantities and the exact mix are up to you. Go with whatever flavours you think taste good together, jut make sure that you’ve got enough to cover the beef completely on both sides. Chop the herbs very, very finely, and mix in two finely chopped garlic cloves, a healthy grinding of black pepper and about twenty-five grammes of salt. Spread the herb mixture out on a shallow tray and roll the beef in it until the meat has picked up all the herbs and salt and it’s completely covered. Lay the beef, flat, on top of a pair of bay leaves in a non-metallic dish and cover with sheet of plastic. A sandwich bag slit open is perfect. Y0u need to press the beef, so now’s the time to head for the shed/garage and get one of those small offcuts of wood that you knew would come in handy one day. You need a piece of wood that fits the dish snuggly, so that you can lay it on top of the plastic covered meat and weigh it down with a few tins of baked beans. Once you’ve finished with the saw and got the wood to fit the dish, put the whole lot in the fridge. Turn the meat every day and leave it there for at least two days and up to four or five says if you want a stronger flavour or are working with a very tough cut of meat. 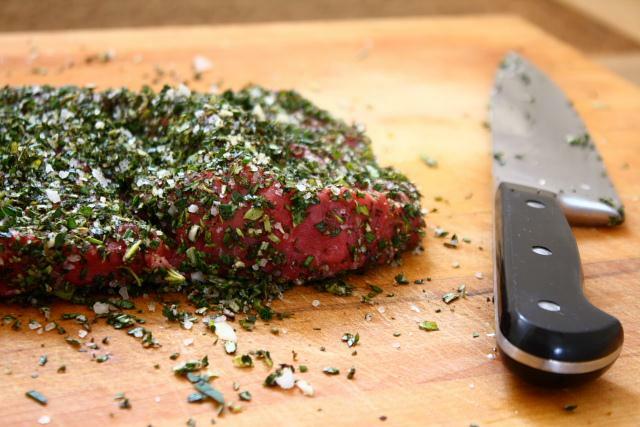 When the beef is ready, wash away all the salt and herbs and slice the beef very, very thinly with a big, sharp blade – a long bladed knife will give better results. This takes some practise, but the finer, the better. Serve with salad and cubes of Gorgonzola. I’ve had some difficulty translating the name of this dish. The recipe came from a cookery course at a big Italian restaurant in Leeds, but when I tried to get a translation of the word ‘messada’ the otherwise trusty Google Translation service scratched its head and shrugged its digital shoulders. I asked a few of Yorkshire’s finest Italians what they thought on Twitter and the general consensus was that they’d never heard of it before, but it might be a dialect word, perhaps from Tuscany. The only thing everybody agreed on is that ‘bue’ means ‘beef’. Any ideas on ‘messada’, though would be gratefully received. This looks wonderful. Am definitely going to try it. Hear hear to the comments about wonderful Dawn, at Binns of Saltaire. She is a truly brilliant butcher. And still no joy on 'messada' – neither my dad or nonna had a clue – but they're not Tuscan so that theory may still prove true. Those pork chops from Binns are the best in the world. Fact. This is just what I need for dinner. I am not going to make it tonight, but maybe tomorrow. So I will keep dreaming about it. In the meantime I am going to drink one more pint of British style beer. I mean ale. Oh, this photos are so full of flavor. Thanks! Cheers! 'Beer' is OK…we normally call it 'beer' not 'ale'. Cheers! 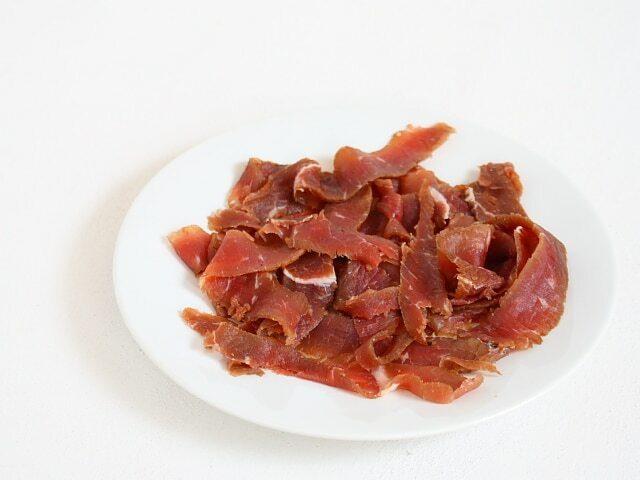 Wow this cured beef looks amazing! Your photos are beautiful too! I agree, Binns are absolutely brilliant and I love wonderful eccentricity of …& Daughter. We should have more establishments like that. Out of interest, which Italian restaurant in Leeds does a cookery school? I spent last night with Google trying to find some decent courses in West Yorkshire and was a little disappointed with the results to be honest. Casa Mia, on Millenium Square…their pasta masterclass was fantastic – they taught me how to make fresh pasta, which is something I've struggled with for years. Can't help you on Messada I'm afraid. Too busy working out when I can make this beef. I'm not a great fan of beef tartar but would happily slice this up and eat it with pickels n bread. This is a 'must try'. Thanks for sharing such an unusual dish. Hi Rich, I've been reading and enjoying your blog for a while. just wanted to add to the comments about the brilliant Dawn at Binns and daughters. I love the fact that it is no sense a 'posh' butchers but just a brilliant, local one – we buy pretty much all our meat there – made an enormous ragu of wild boar last weekend. am pregnant at moment so not sure about cured meats? but am def. having a go at the pickled watermelon rind you blogged recently – amazing! thinking there really should be some kind of saltaire, foodie, supper club, restaurant at home thing going on! No, I'd stay well clear of this if you're pregnant – pregnancy and raw meat probably don't mix very well at all…. …I reckon that's the closest we've got here. 'Messada' could just be some mangled typing…. This looks fantastic. I love reading about techniques/recipes that are a little different. Could be Messa da Bue, rather than messada. ‘Messa da’ translates to ‘discarded’, which could mean unused cuts. Or ‘messa da bue’ also translates to ‘made from ox’.